Woman viciously attacked along the 100 block of South 3rd Street in Millville, New Jersey, on Wednesday, April 26, 2017. 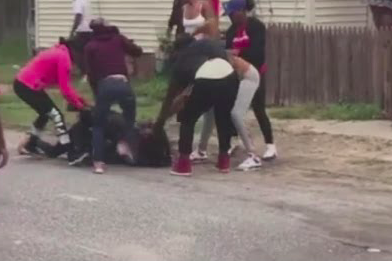 Authorities in Millville arrested four people who were filmed last week brutally beating a woman in the middle of the street as horrified witnesses watched the attack unfold. The incident occurred last Wednesday along the 100 block of South 3rd Street, where a woman was repeatedly kicked and struck before she managed to walk off on her own power. Millville Police Chief Jody Farabella told 6ABC police have made four arrests and more could be forthcoming. "We're not going to stand for that," Farabella told the station, adding that there will be increased patrols in the area to prevent similar incidents from occurring in the future. The identities of those arrested and pending charges were not immediately released. Anyone with information about others who may have been involved in the attack is asked to contact Millville police at 856-825-7010.